Welcome to the next age in energy. Renewable energy sources, especially solar, have been booming. According to a report compiled by SolarPower Europe, the world doubled its solar capacity to 305 gigawatts in 2016, with the United States and China leading this global trend. China is the largest solar energy producer in the world, and in 2016, its solar capacity increased by twice as much as it had in 2015. Overall, the country produced 77.42 gigawatts of solar energy to generate 66.2 billion kilowatt-hours of power. Meanwhile, the U.S. nearly doubled its own yearly increase, from 7.3 GW added in 2015 to 14 GW added in 2016, with some states showing remarkable growth. For instance, New York increased its solar power use by more than 800 percent. Other world leaders include India, which recently became home to the largest solar farm in the world. Although the EU experienced cutbacks in solar adoption incentives, solar capacity in the U.K. increased by 29 percent in 2016, with German capacity growing by 21 percent and French capacity increasing by 8.3 percent. One of the biggest reasons for this growth is a notable global drop in the costs associated with solar. According to The Climate Council, solar prices worldwide have dropped by 58 percent over the past five years. However, despite these amazing gains, the ability to store solar energy for use when the Sun isn’t out remains a problem. Now, Tesla is going to try to tackle that issue with a solar plant in Kauai, Hawaii. Islands like Kauai are ideal for solar-generated power — at least until nightfall, as which point fossil fuel-powered generators kick on. Tesla is hoping to keep those generators from humming all night with a massive new solar farm and energy storage plant. The Kauai plant, commissioned by the Kauai Island Utility Cooperative (KIUC), includes a 13 megawatt SolarCity solar farm and a 52 megawatt-hour battery installation. 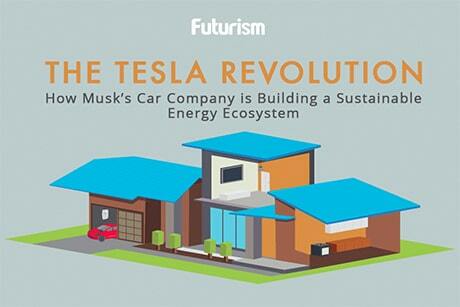 KIUC and Tesla project an annual savings of 1.6 million gallons of fossil fuels. One of the downfalls of most sources of renewable energy is that they are reliant on the natural world and, therefore, intermittent. Both solar and wind power generation, for example, often peak during times of lower demand, like midday. This problem motivated Tesla to create its Powerpack, a huge battery that stores electricity during daylight hours when the supply is ample and discharges it when the Sun goes down and demand increases.